Our monthly Music happening is back this February. This is a popular community happening at Leyden Gallery, a prestigious gallery venue and as always, the night promises to be a spectacular event filled with music and laughter. Musicians, performers and poets are all welcome to perform but please contact us first. Leyden Gallery are open to consider any type of act, the greater the variety in acts the better. 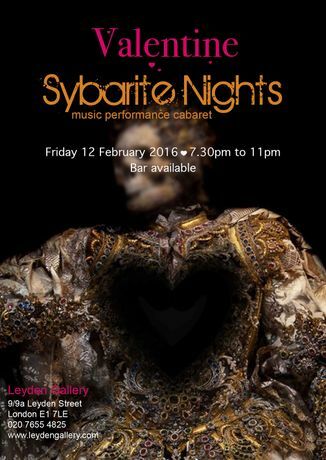 In order to be considered for Valentine Sybarite Nights the following information needs to be sent to info@leydengallery.com. - A web link to YouTube, Sound Cloud or any other platform that is used to publicly showcase work. - A rough set list that can be adjusted to fit the running order when all acts have been confirmed. If you are shortlisted for Valentine Sybarite Nights , we will contact you to further discuss the necessary details.